Dean Martin was my grandma’s boyfriend. That’s what she said every time he came on the television when I was a kid. Of course she was teasing me, but to her Dino was the cat’s meow. She thought he was handsome and funny and she loved all of his movies. I don’t think it hurt that he had a velvety singing voice either. But, what I remember fondly about Dean Martin is his Christmas album. My sister and I would play our parents’ The Dean Martin Christmas Album on the living room stereo over and over and over while trimming the Christmas tree. It was his songs like this that got us really excited for the holidays and all the fun we looked forward to having over Christmas with our family. Of course those were the days before Black Fridays and the Internet and Ipods. An era when life didn’t seem as hectic this time of year. And listening to our parents’ old albums was just about the only way to hear Christmas carols, other than the occasional holiday movie or special presentation on the television. And even though times have changed and the classics have been remade by today’s popular artists, I enjoy the rare moments Dean Martin’s Christmas songs are played on the radio. 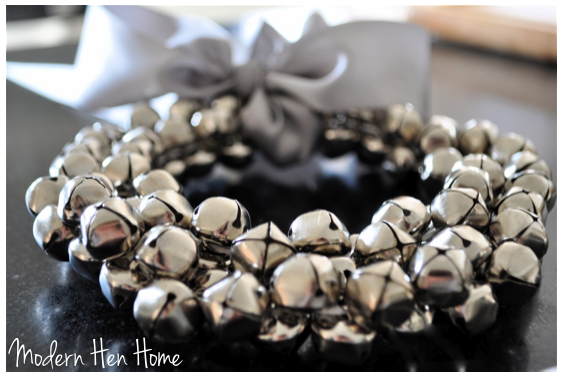 And just like I did as a kid… while adding shiny silver tinsel to the tree… I sing along. And my teenagers stare at me. And they ask questions like… How do you know all the words to that song, Mom? 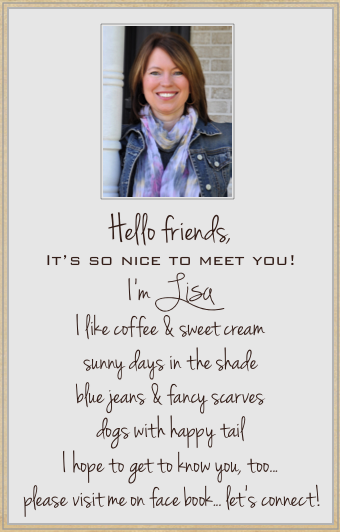 …but I can tell they like Dean Martin’s velvety voice. 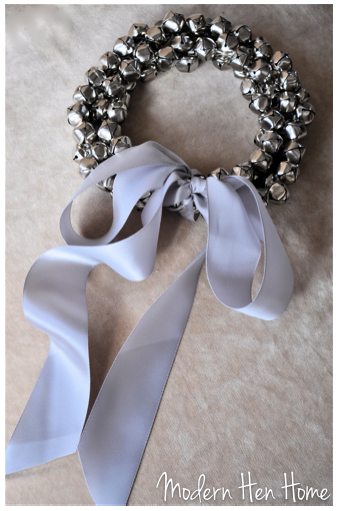 And Silver Bells gets them in the holiday spirit, too. 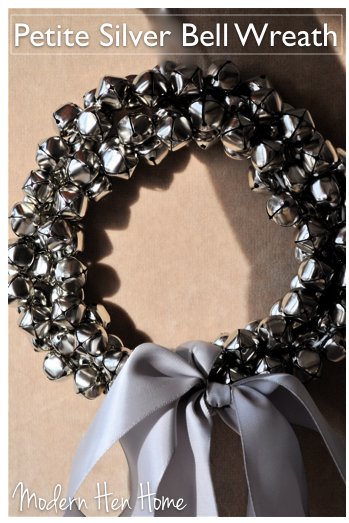 Now Martha Stewart can rock a wreath and a bow. And this sweet little version is inspired by none other than her jingle bell wreath. Bend one end of wire into an eye hook closure and close with pliers. String bells on wire keeping them tight, adding as many as you can until you reach the end. Loop opposite end of wire into a hook and clasp to the eye hook at the other end to form wreath and pinch to close and secure. 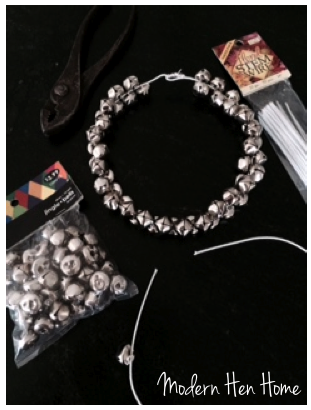 Repeat stringing of leftover bells on a second wire (there should be less bells than the number on the first wire). 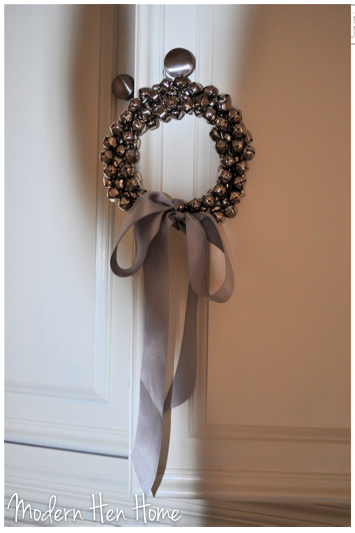 Lay the smaller wreath inside the larger one and shape into a circle. 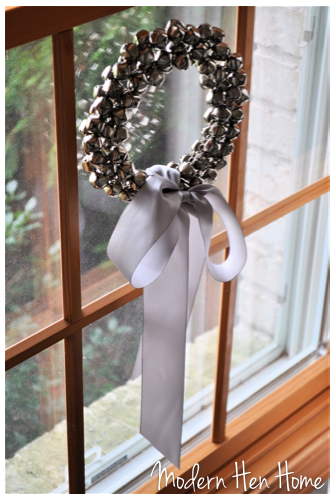 Take dental bands and connect one bell from small wreath to closest bell on the larger wreath, securing wreaths together where gaps appear. Tie ribbon over eye-hook closure to hide. Snip both ends of the ribbon at long angles. (I tied the ribbon to the desired length before clipping from the ribbon spool.) Allow bow to swag long and loose for a glamorous, casual look. Oh, and have you heard this latest rendition of Mary, Did You Know? from Pentatonix? It blew me away. You can listen and watch the video here… The True Gift of Christmas.